To many personal injury law firms, a client's case is just another file gathering dust on the proverbial shelf. The Epstein Law Firm knows that to our clients and their families, theirs is the only case that matters and that proper legal representation means everything. Though our lawyers provide outstanding legal representation in a wide variety of areas, our focus is on serious personal injury and catastrophic wrongful death litigation. Personal injuries and deaths not only cause physical pain and suffering, but also emotional and financial disaster through loss of work, medical bills, and stress placed upon injured individuals and families. Whether caused by medical malpractice, a motor vehicle accident, defective product, or other negligent, careless, or reckless conduct, injuries alter lives forever. The Epstein Law Firm helps to relieve the headaches that an injury brings, and allows clients to attend to immediate health, safety, and financial concerns while we pursue a variety of legal steps to obtain justice. 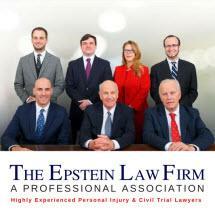 While The Epstein Law Firm has compiled an outstanding track record of success in cases throughout state and federal courts in New Jersey, we know that the most aggressive, expensive, and time-consuming litigation strategy is not always the best solution for every client and his or her family. In every situation, therefore, we seek to identify the primary objective of clients, design a solution to fit that objective, and implement that solution in the most effective manner possible. Our clients have come to expect the highest quality legal services, attention to detail, and results, all at a fair and reasonable cost. Clients can rely on us to be approachable, responsive, efficient, and effective. In short, you should leave the worrying to us. The Epstein Law Firm- specifically partners Barry, Michael and April- are at the very top of the legal profession and have been for decades. Their longevity and success is a testament to their commitment to professional excellence and putting their clients first. They are fierce advocates, highly intelligent, diligent and affable. I have the utmost regard for their legal expertise and ability to get the best results for their clients. If you have suffered a personal injury, or a relative has suffered a wrongful death, you simply must contact the Epstein Law Firm to advise and represent you.